Continuing our series, here is another post on the men, also looking at Marvel characters. You can read previous entries on women (part one), women (part two), men (part one), men (part two), the X (wo)men, non superhero comics, men (part four), men part five and finally women (part three) and a Spider-man. Nick Fury is the General of S.H.I.E.L.D., a governmental agency specialising in espionage and law enforcement. 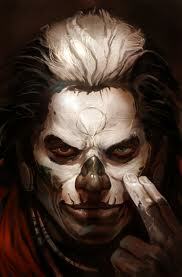 Marvel's Ultimate universe is a re-imagining of their 616 (main) universe. It was created to entice new readers into Marvel comics and was intended to operate as a good jumping on point, as it started the world from scratch, as it were. In the 616 universe Nick Fury is white, in the Ultimate universe, he is black and is drawn to look like Samuel L Jackson, who portrays Fury in the recent Iron Man, Hulk and Thor films. You can start reading about this Nick Fury in The Ultimates: Super-Human and The Ultimates: Homeland Security. Black Tarantula is a Spider-Man character. His civilian name is Carlos LaMuerto and he is a Brazilian crimelord. He has enhanced strength, stamina, agility, speed and healing, and he can heal others. Most recently he has been working with Daredevil, and if he is not completely reformed, he's certainly got a better moral outlook than he used to have. You can view a list of his appearances here. 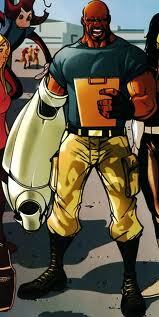 Gauntlet is African-American and a principal character in the Avengers: The Initiative series. Otherwise known as Joseph Green, he is the drill sergeant for the Avengers training program. Green gets his code name from the alien gauntlet that gives him super strength and energy blasts. You can start reading about him in the following Avengers: The Initiative books: volume 1: Basic Training, volume 2: Killed in Action, volume 3: Secret Invasion, Disassembled, Dreams and Nightmares and Siege. Stay tuned, there's plenty more of these posts coming up!